The Bahrain Grand Prix was the first Formula One race to be held in the Middle East when it joined the calendar in 2004. The 2019 Bahrain Grand Prix is on March 28-31. Bahrain International Circuit (otherwise known as “Sakhir”) was designed by Hermann Tilke and built in just 16 months at an estimated cost of $150m USD. The tarmac of the track is made from imported graywacke aggregate from Shropshire, England. The first race in 2004 was won in dominant fashion by Michael Schumacher in the Ferrari F2004. The circuit has a variety of layouts for different events. For 2010, organisers decided to use the ‘endurance’ layout of the circuit to celebrate Formula 1’s diamond anniversary. The lengthened track was met with negative reaction from the drivers and was never used again in F1. The Bahrain Grand Prix was first held under floodlights in 2014 partly to provide a better spectacle and more comfortable conditions for spectators, but also to give the race a better time slot with important TV audiences in Europe. The track has a seating capacity for 45,000 spectators, including 10,500 in the main pit straight grandstand. The circuit also features a distinctive 8-storey VIP tower. According to the circuit’s website, there are over 4700 staff working at the circuit on Grand Prix weekend, including 1800 police & security staff, 600 track marshals and 25 doctors. 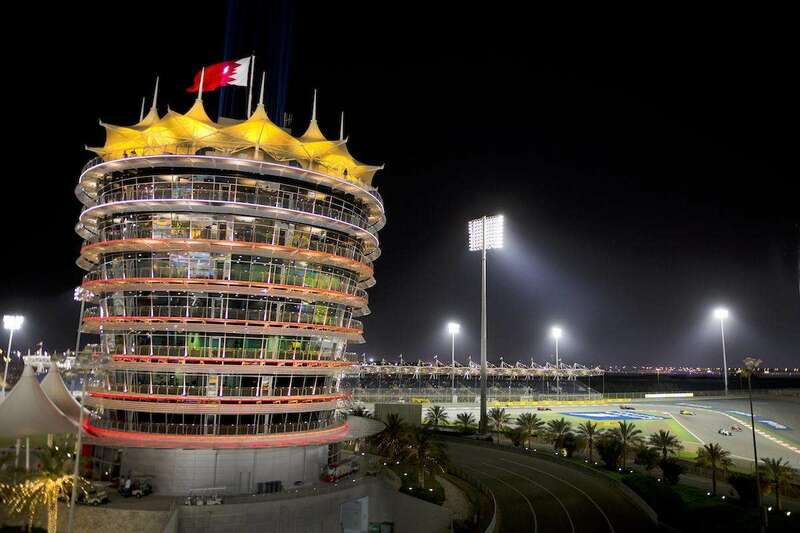 Bahrain Grand Prix: did you know? Sebastian Vettel is the most successful driver in Bahrain, with four wins. Lewis Hamilton is the only other current driver to have won here, having taken victory in 2014 and 2015. Ferrari is the most successful team in Bahrain with six victories; Michael Schumacher won in 2004, Felipe Massa in 2007 and 2008, Fernando Alonso in 2010 and Sebastian Vettel in 2017 and 2018. Bahrain is one of only three current F1 circuits where McLaren have not recorded a victory (the others being Sochi and Baku). Pedro de la Rosa holds the lap record at Sakhir. He set the 1m 31.447s lap for McLaren while filling in for Juan Pablo Montoya in 2005. It was the Spaniard’s first Grand Prix since Japan 2002. Kimi Raikkonen has finished on the podium eight times in Bahrain but has never won the race. After the 2007 Bahrain Grand Prix, Fernando Alonso, Kimi Raikkonen and Lewis Hamilton were all equal on points at the top of the championship. The last time that had happened was in 1950, after the Indianapolis 500. Local protests inspired by the Arab Spring resulted in the race being cancelled in 2011. The race had been rescheduled for later in the year, but was eventually cancelled. A German driver has been on pole at half of the fourteen Bahrain Grands Prix held since 2004. Less than half of the races held at the Bahrain International Circuit have been won from pole. Just six of the fourteen races have been won from the front. No race here has been won from further back than fourth on the grid. Sebastian Vettel recorded the only DNS of his F1 career so far here in 2016 when his Ferrari engine failed on the formation lap. 2006: Raikkonen’s recovery drive: Kimi Raikkonen was eliminated in Q1 in Bahrain in 2006 after a suspension failure. Starting at the very back of the field in 22nd, McLaren placed the Finn on a one-stop strategy. With a mix of strategy and his fine overtaking skills, Raikkonen finished in third place behind Michael Schumacher and Fernando Alonso, who had an epic battle for the lead throughout the Grand Prix. It was Alonso who came out on top, barging past Schumacher after his second pit-stop. Notably, the race was also the first appearance for future World Champion Nico Rosberg. He set the fastest lap of the race, becoming the youngest driver to do so at the time. 2008: Kubica and Sauber’s only pole: Robert Kubica took the only pole position of his career at Sakhir in 2008. He also became the first Polish driver to start a Grand Prix from the front of the grid, as well as marking Sauber’s only pole position so far in Formula 1. Kubica lapped just 0.027s faster than Felipe Massa, which remained the smallest margin pole was taken by in Bahrain until 2017. Kubica was unable to convert pole into victory, finishing the race in third as Massa took the win. 2010: Alonso’s first Ferrari win: The 2010 F1 season began in Bahrain amidst plenty of intrigue with new teams, new driver line-ups and the return of Michael Schumacher after a three-year absence. While Sebastian Vettel set the pace in qualifying, spark plug issues on his Red Bull slowed him down and Fernando Alonso was able to capitalize, taking victory on his first appearance with Ferrari. It marked only the sixth time a driver had won on their Ferrari debut. It was an afternoon to remember for the whole team too, as Felipe Massa finished as runner-up on his first appearance since his accident at the 2009 Hungarian Grand Prix. 2014: Duel in the desert: The 2014 Bahrain Grand Prix is seen as the starting point of Lewis Hamilton and Nico Rosberg’s bitter rivalry as Mercedes team-mates. The race, which was the 900th F1 Grand Prix, saw Rosberg start from pole. Hamilton got the better start however, and led the opening stages. The pair scrapped for position before the first pit-stops with Hamilton ultimately remaining ahead and thus being given the privilege of the first stop. The Safety Car was called out later, after Esteban Gutierrez’s Sauber rolled as the result of a collision with Pastor Maldonado. The Safety Car period prompted a thrilling conclusion to the race as Rosberg, still behind Hamilton, was now on the faster tyre compound. There was little the German could do though, and after more wheel-to-wheel battles Hamilton won the race, equaling Juan Manuel Fangio’s tally of Grand Prix victories. Here’s everything you need to know ahead of the 2019 Bahrain Grand Prix weekend! The lowdown on the trackside experience at the Sakhir Circuit for the Bahrain Formula 1 Grand Prix. The next race takes place on March 28-31, 2019. The best ways to get to Bahrain for the Bahrain Formula 1 Grand Prix, plus advice on getting to the Sakhir Circuit. Learn about how much it costs to attend the Bahrain Grand Prix. The next race at Bahrain International Circuit is on March 29-31, 2019. Your guide to buying tickets for the 2019 Bahrain Formula 1 Grand Prix at the Sakhir circuit. 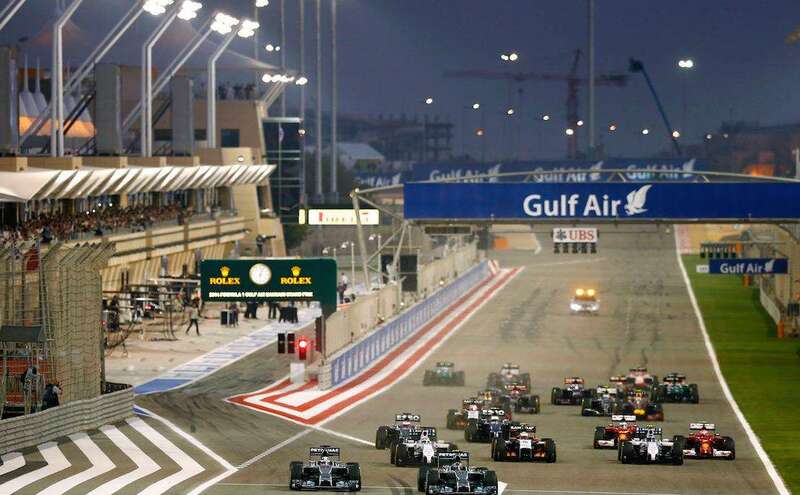 The Bahrain Grand Prix was the first Formula One race to be held in the Middle East when it joined the calendar in 2004. The next race is on March 28-31. From cheap apartments to five-star luxury, we’ve chosen the best places to stay for the Bahrain Grand Prix.